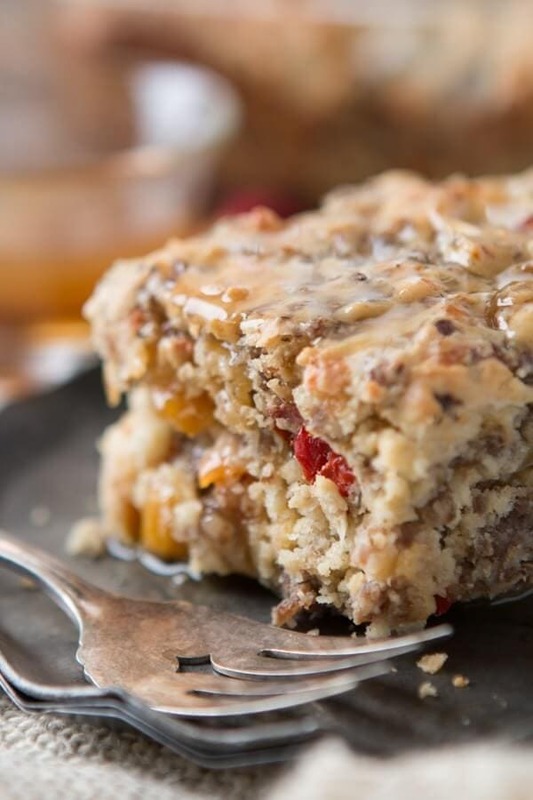 Savory breakfasts tend to always be the same thing, but we’ve started making this Southern sausage breakfast cake with maple butter sauce and it’s delicious! Southern Sausage breakfast cake with maple butter sauce, please!! 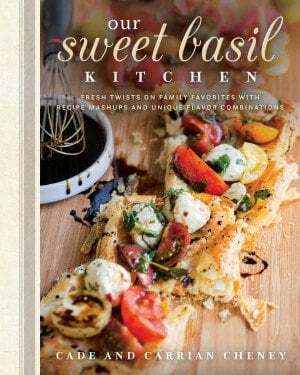 I feel like it’s kind of a mashup of Southern meets the Pacific Northwest, which is like our marriage, haha. 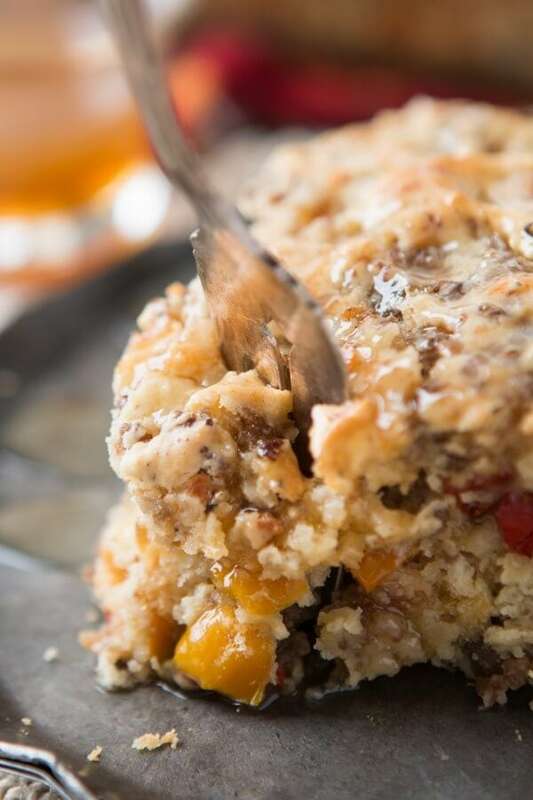 A breakfast cake recipe that is savory is an absolute must for your family. 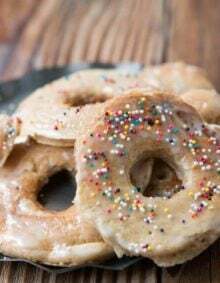 Sweet is all kinds of wonderful but you don’t always need to start the morning off with sugar. 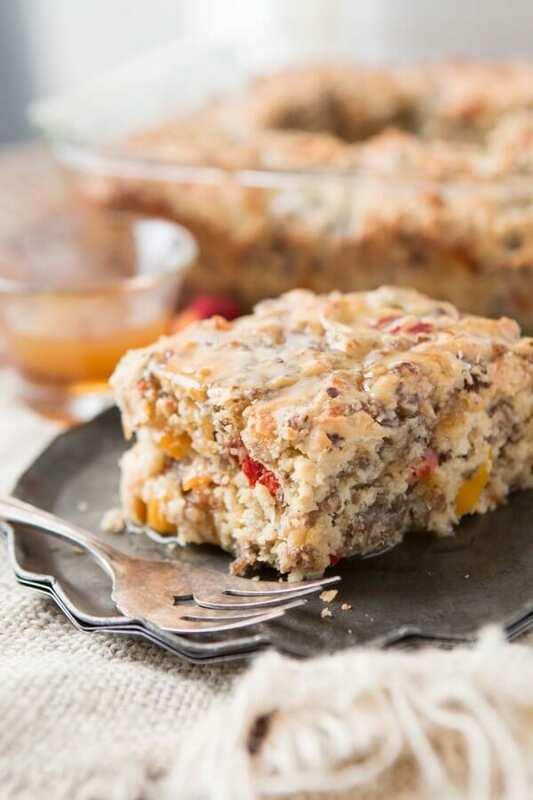 This breakfast cake recipe is slam packed full of breakfast sausage, peppers and cheese! Washington is all about the coffee shops and coffee cake. 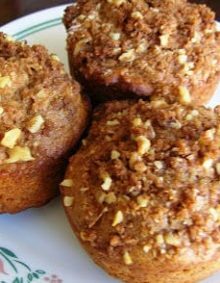 While we don’t drink coffee due to our religious beliefs we certainly love coffee cake and it only seemed right to make a savory Southern version. I actually thought this recipe was going to be a flop when I stuck it in the oven. I had gotten a little crazy in making the sausage and peppers and at the same time, knowing we only have bird eaters for children I had made only enough batter for an 8×8″ baking dish so when I combined everything together the batter was crazy thick and so full of meat and veggies I wasn’t sure there would be any “cake” to this dish at all. I was pleasantly surprised to take it out of the oven and discover that it actually balanced out really well and then since I was on such a natural high from it working I went ahead and melted butter and real maple syrup together for what turned out to be the best addition to the cake ever! Seriously, it’s a must try and don’t be afraid of all that meat, it’s fantastic! 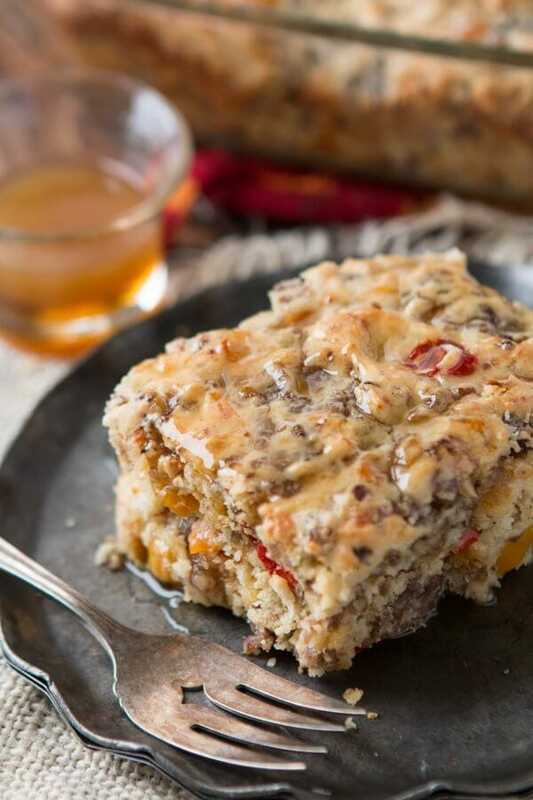 Savory breakfasts tend to always be the same thing, but we've started making this Southern sausage breakfast cake with maple butter sauce and it's delicious! Spray an 8x9" baking pan with nonstick spray. In a skillet over medium heat, add the sausage and cook until browned, stirring occasionally to break up the meat, about 3-5 minutes. Remove to a mesh strainer in the sink to allow the grease to drain off. Place the skillet back on the burner, no need to wash it first, add a drizzle of oil and the onions and peppers. Cook, stirring occasionally for 3 minutes or until the onions are soft and translucent. In a bowl, add the flour, baking powder, shortening, pepper and salt. Using a pastry cutter or fork, blend the shortening into the flour. In a small bowl, whisk the egg, buttermilk and sour cream. Create a well in the middle of the dry ingredients and add the egg, buttermilk and sour cream. Add the sausage and peppers on top and stir until just combined. Spread the very thick, sticky batter into the baking dish and bake for 40-45 minutes or until set in the middle and golden brown. Meanwhile, melt the butter and maple syrup together and set aside. Remove the cake from the oven and allow to cool for a few minutes then pour the sauce all over the top and serve immediately. 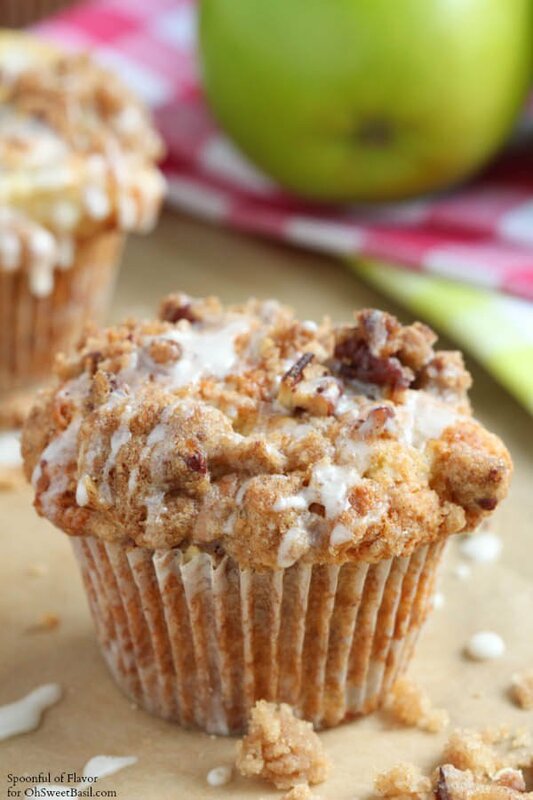 Looking for the best muffin ever, ever, ever? 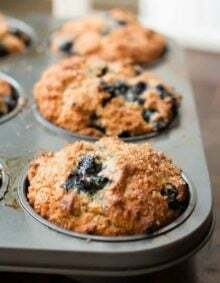 This one has a coffee cake flair with a yummy crumb topping! Another savory breakfast you should try…cheesy baked eggs or this breakfast casserole!! Yes! It makes awesome leftovers! That’s a very interesting idea, thanks very much. I never thought of breakfast in a cake. Looks so delicious! I always love dipping sausage in maple syrup so these flavors are right up my alley. Do you know of any reason why I couldn’t substitute butter for the shortening? Thanks!